As a way of procrastinating Spring Cleaning, I've been on a quest to create a simple and practical entry in my home. Even if your house is lacking a sweeping entryway or a billowing chandelier, it's still the first thing that greets you upon arrival or bids adieu when you depart. Above are some of the ideas I've stumbled across on Pinterest so far! I promise to post pictures when I've finished redoing mine. 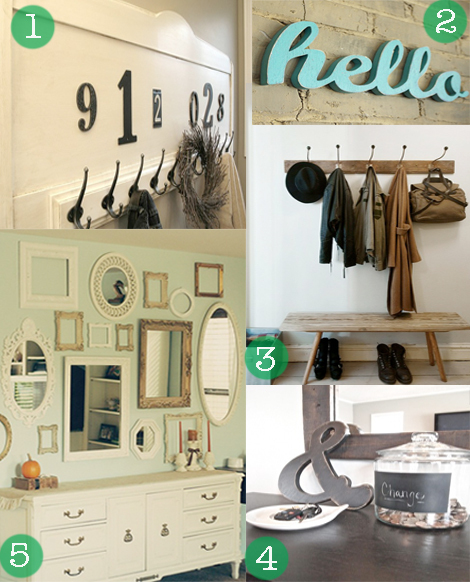 How have you made your entryway feel less like a hallway and more like a way into your home?